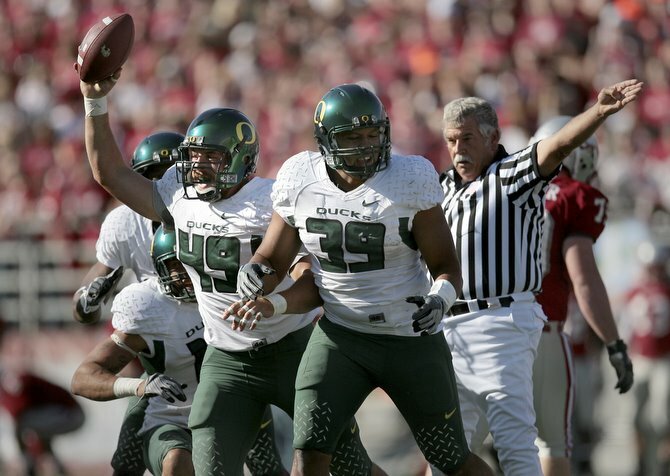 Time for a look at opponent number five on the WSU schedule, the Quack Attack. And let me just ask, first off, what do the Coug fans think of Oregon? I think it’s a real love/hate thing with them. I think we love them when they embarrass UW on a yearly basis, as they have for the last several seasons. I can’t help but admit that it’s fun to watch them steamroll the purple-n-gold. But on the flip side, it’s probably true that WSU fans on a regular basis? Yeah, they pretty much despise the green-n-yellow. A cocky NW rival who are rich, powerful and absolutely in LOVE with themselves, they aren’t an easy bunch to wrap your arms around. They probably come in a solid second in “self-worship” in the PAC-10, just behind USC and slightly ahead of UW? I know, that sounds like petty, jealous crap from a have-not school like WSU. But it is what it is. 2008: 10-3, 7-2 in the PAC-10, good for a 2nd place tie with Oregon State. After humiliating the hated in-state rival Beavers in a wipeout of a Civil War….and killing the Rose Bowl dreams for said Beavs in the process…..Oregon culminated a 10-win season with an entertaining victory over Oklahoma State in the Holiday Bowl, a 42-31 thriller that saw over 1,000 yards of total offense combined! Now 10-3 was great, but there were some struggles early in the year. Even though the running game was strong, the QB situation was spotty at best in losses early to Boise State and a 44-10 crusher at USC. But that all changed when JC transfer Jeremiah Masoli took control of the position. The Oregon offense hasn’t slowed down since. 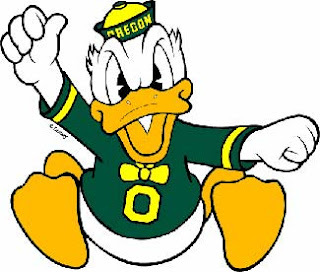 FANS ARE: Quacking about their successful ’08, so much so that visions of a PAC-10 title are dancing in their heads for ’09. And maybe they are a little nervous about losing Bellotti, the all-time winningest coach at Oregon at 116-55. While Phil Knight has been a huge help – let’s not kid ourselves, the locker room bells-n-whistles and fantastic facilities are a huge boost to recruiting – Bellotti really built an impressive program in his 13 seasons at the helm. But they are also somewhat calm over the idea of Kelly’s leadership. While not exactly a blowhard, Kelly does have some cocky confidence about him. He even ridiculed the UW chest-thumping over their spring game results, criticizing the idea of the first-stringers taking on the backups. Even though he’s never been a D-1 head coach, there isn’t much doubt among the Oregon faithful that the time is right, and Kelly is ready for this. LAST YEAR vs. WSU: A huge 63-14 whipping behind the woodshed. The Cougs turned it over four times, but Oregon simply overmatched them in talent and speed. It was over early as Oregon sprinted to a 14-0 just 3+ minutes into the game as the Cougs coughed it up on consecutive possessions to open the game. It was 35-7 at the half, and that was all she wrote. The Ducks would rush for 346 yards in a game where pretty much everything went wrong for WSU. OFFENSIVE SYSTEM: Oregon is clearly the kings of the spread read-option offense, at least on the west coast. Not as pass-happy as the spread offenses like Oklahoma or Texas, Oregon is a machine on the ground. It’s not the easiest system in the world to pick up and play, as we saw with some early-season QB struggles from all the bodies they shuffled in and out of the position last year in the quest to replace Dennis Dixon. But when things settle down, and they are clicking as they were late in ’08, the offense is simply a sight to behold. ’08 OFFENSIVE RATINGS: Led the PAC-10 in scoring offense (41.9 ppg), total offense (484.8 ypg), and rushing yards per game (an amazing 280.1 yards per game, more than 80 yards better than second-best Stanford). A middle-of-the-road passing attack, at least statistically, finishing fifth it the conference in passing yards (2662 yards) and TD’s (20). ’09 RETURNING OFFENSIVE STARTERS: Five, including starting QB Jeremiah Masoli. TOP RETURNING OFFENSIVE PLAYER: It is tempting to go with LeGarrette Blount, the running back who exploded for 1,000 yards and 17 rushing TD’s in his first year in Eugene. But Blount was just part of the running attack, and Jeremiah Johnson actually led the team in rushing last year (1201 rushing yards, compared to 1002 for Blount). Blount is big, strong and has a nose for the end zone, but without a decent QB, it’s hard to imagine he would put up the same kind of numbers. That’s why I’ll go with Jeremiah Masoli. After some severe up-and-down learning moments throughout 2008, and dealing with a QB rotation where several QB’s were splitting playing time each week, Masoli finally pulled away from the pack late in the year. But after a 7-for-21, two-int game in a loss at Cal on 11/1, Masoli rebounded to play his best football to close out the season. 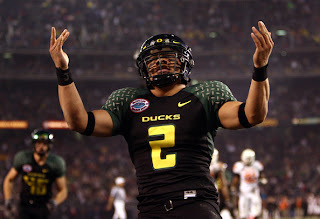 Masoli would throw seven TD’s with only one INT in his last four games, all wins by the Ducks. He also ran for seven TD’s over those last four games, as he truly became a dual-threat headache for opposing defenses. He capped it all with a fantastic Holiday Bowl, where he threw for 258 yards and a score, but ran for 106 yards and three more TD’s. Fast and strong, he’s like another dual-threat success for the Ducks. While he might share the load a bit in ’09 with some of the other QB’s, there is little doubt that Masoli will carry the offense next season. DEFENSIVE SCHEME: A 4-3 attack, and they will get after it with blitzing from their linebackers. They also love to put the strong safety in the box, close to the line of scrimmage in the “rover” position. Having an extra safety almost like a linebacker puts more pressure on their corners, but they like to roll with a lot of one-on-one coverage on the outside anyway. DEFENSIVE RATINGS: Strong against the run last year (119.4 ypg, second only to USC), they surprisingly had the worst pass defense in the conference last season (270.2 ypg). And it wasn’t even close, as Stanford was ninth, giving up 226.7 yards per game. But in a strange twist, Oregon actually led the conference in sacks, with 40, and finished third with 16 interceptions. So they were a play-making type defense, but with the big plays or big risks came some big rewards for the opposition. This wasn’t an easy choice. While Oregon might not have a huge quantity of starters back in ’09, they make up for it in quality. TJ Ward wasn’t the big name guy in Oregon’s secondary last year, not with returning starters like Jairus Byrd, Walter Thurmond Jr, or Patrick Chung. But Ward surpassed them all, totaling a team-high in tackles at 101, including 5.5 for loss. And D-end Will Tukuafu was second only to all-timer Nick Reed on the team with 7.5 sacks and an excellent 17.5 tackles for loss. However, I’m going with the rising linebacker, Spencer Paysinger, as the top returning defensive player for ’09. After recording just four tackles as a frosh in ’07, Paysinger had a big breakthrough performance in ’08, winning the weakside linebacker job as a sophomore and starting every game last year. He opened a lot of eyes with 12 tackles in his first-ever start vs. UW to open the year. For the season, Paysinger was second on the team in tackles (95), with an impressive 12.5 for loss. And he finished the year with a kick, including a 68-yd INT return for a TD vs Oregon State. Paysinger had a strong Holiday Bowl as well, with three tackles for loss. He has excellent size at 6-3, 220, and runs extremely well. Already one of the strongest linebackers on the team, he should have a huge junior year. You can be sure he’ll appear on many all-conference lists heading into ’09. 1) Masoli looked great at the end of the year, but the WR’s look a little thin. The running game should be fine, but who will Masoli throw to? This is definitely an issue. Masoli loses two of his top three WR targets from last year in Terence Scott and Jaison Williams. And after spring ball, it was announced that WR Aaron Pfulgrad would get his release from the program and would leave Eugene. But there is talent here, including TE Ed Dickson, who should have a strong senior year. And there was some good buzz this spring surrounding USC transfer Jamere Holland, an ultra fast and talented player who could be a big boost to the passing game. But with a running game so superior, it might not even matter that much. This is hardly a pass-happy offense. 2) What about the losses on the O-line? Now this IS a bigger issue. Gone are three experienced senior starters, led by all-everything center Max Unger, now a Seattle Seahawk. They will have to get things sorted out in fall camp, but offensive line has to be the biggest concern of the offense, if not the entire team. It’s hard to replace good, experienced horses up front and not expect some real bumps in the road? 3) And of course, the schedule. And what a schedule it is. Out of conference, they open with a doozy, on the smurf turf at Boise State on a Thursday night special. They also get Sugar Bowl champ Utah at home later in September. But they play just four conference road games this year, and they should be against mid-to-lower tier PAC-10 teams (@UCLA, @UW, @Stanford and @Arizona). In other words, the top-tier teams in the conference? They get them ALL in Autzen Stadium. That means USC, Cal, Oregon State, they all have to go through Eugene. WSU Football Blog SEZ: Love ’em or hate ’em, Oregon is good. Really good. And awfully entertaining, especially on offense. But now, it’s a new world at Oregon. Mike Bellotti has started the proccss of moving upstairs, handing the headset to the top offensive coordinator around, Chip Kelly. For the first time since the ’94 Rose Bowl season, a new head coach will lead the program. Kelly gets his shot at the full-time head coaching gig that brought him across the country in the first place. Kelly, if you remember, landed in Eugene all the way from New Hampshire when he signed on to lead the Oregon O in ’07. It was an interesting hire at the time, and to come all the way across the country after 13 years at New Hampshire, well, it seemed like there would be more to this story. And what do you know, here we are. I think overall, things will be relatively the same as they were under Bellotti. They will play the same style of football, with the tough-to-handle offense and aggressive defense. But for this year, there are some real losses that are hard to overlook on both sides of the ball. All-timer defensive end Nick Reed has moved on and taken all those sacks and tackles for loss with him. Patrick Chung and Jairus Byrd have gone to the next level. So the defense has some holes to fill. But the biggest issue I can’t help but think will derail them a little bit is the offensive line. They have some talented kids in the pipeline ready to take over up front, but man, young or inexperienced offensive lines just always seem to struggle a bit, especially early on. But if they can take care of business early and some of those linemen get some solid game time under their belts, they should be fine. The best news though is that the trigger man is back on offense, and that is just huge for a scheme like this. And with that favorable home schedule, where Oregon is 56-13 in their last 69 games? You have to like their chances to be at least an upper-division finisher, if not a legit challenger for a New Year’s day bowl. That’s it for today. Enjoy it, and as always, GO COUGS! You are currently browsing the archives for the Chip Kelly category.